Product review coming your way! Let me start by saying I’m not getting paid to advertise this product, I simply am because I love it and think it’s worth mentioning and suggesting for all of you out there with little babies! For Christmas last year, my husband’s Aunt stopped by with a bunch of goodies for my kids! She knew we were driving down to Florida the day after Christmas so she wanted to give them their things before we packed, just incase we wanted to bring anything with us. Let me start by saying, she always finds really good, out of the box, gifts that always seem to come in handy! After we sat and watched the boys open their things and decide what they were bringing in the car for the ride, I sat on the floor and began opening up the baby’s things. 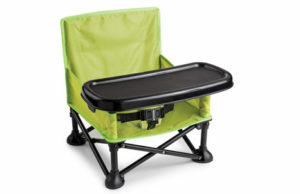 The last thing I opened was, what I refer to as, her baby tailgating chair! It’s the cutest, most easy to travel with, super useful chair! It comes with a travel bag that it folds up and easily fits into, as well as the tray that comes with it! We packed it with the rest of her stuff, as an “extra” thing that we’d have, just incase we needed it. Well not only did we need it but we used it each and every day we were there! The Summer Infant Pop N’ Sit Portable Booster Seat is such a great product! It comes with straps to strap the baby in, as well as straps to attach it to a chair if need be. We simply sat it on the kitchen island. It must be said that we never left her in the chair unattended. The bottom of the legs of the chair, have grips that make it non slip. The baby was super comfortable in it and never complained to get out. We never brought it out with us while we were there but once we got home, it came everywhere with us! On nice days when the boys are playing outside and it’s time for the her to eat, I open up the chair and sit it on our front porch. It’s so easy to use and clean and fold up! My husband’s cousin has one as well and she recently brought it to my daughter’s 1st birthday party! She didn’t place it on the table or floor, she attached hers to the chair and her son, who is about 6 months older than my daughter sat comfortably in it while he ate. It’s really a great product. I don’t recommend things often because I know everyone has different tastes and different wants/needs. With this chair though, I’m making an exception! I, 100 percent, recommend this to anyone who has a baby or needs a very useful gift!